TriMet riders—especially those commuting across the Willamette River—are urged to build in an extra 30 to 60 minutes for trips during the scheduled arrival and departure of ships that are part of the Rose Festival’s 2018 Fleet Week. The fleet will pull into port at the Portland Waterfront Wednesday and Thursday afternoon June 6 and 7 and depart Monday morning, June 11. Since both the arrivals and departures will raise bridges during afternoon and morning commutes, TriMet is asking riders to be flexible and patient, and to schedule extra time to get where they’re going. All MAX trains will be stopped for Steel Bridge lifts as ships pull in. Buses traveling across the Broadway, Steel and Burnside bridges, lines 4, 8, 12, 17, 19, 20, 35, 44 and 77 will also experience delays, so consider taking lines that cross the river using the Morrison, Hawthorne, and Ross Island bridges instead. Our crews will be monitoring the lifts and adjusting service as necessary, which may include shuttle buses across the river for those taking MAX. Riders should check trimet.org/alerts before they head out as service may change repeatedly during the affected times. Once the ships are in, avoid downtown parking costs and hassles and take TriMet to enjoy visiting and touring the ships during Fleet Week, an event steeped in tradition. Fleet Week has been a part of the Rose Festival since it began in 1907, and one of its purposes is to celebrate and thank active and reserve military personnel and all veterans. TriMet wants to help you join in the festivities. All MAX lines and some 20 bus lines run through Downtown Portland and can drop you a short distance from Waterfront Park. Plan your trip using TriMet’s Trip Planner. Fares are required on all TriMet vehicles. Pick up a Hop Fastpass card from one of hundreds of local retailers, load value on it and use it to ride. No card? No problem. Use Apple Pay, Google Pay or Samsung Pay to purchase an adult fare instantly using your mobile wallet! Android users also have the option of using a Virtual Hop card in Google Pay to get the same benefits of a plastic Hop card. 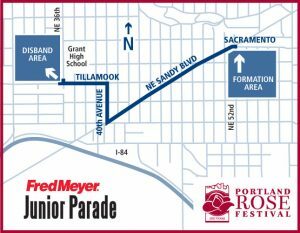 Get information about the tours, hours and restrictions at rosefestival.org. 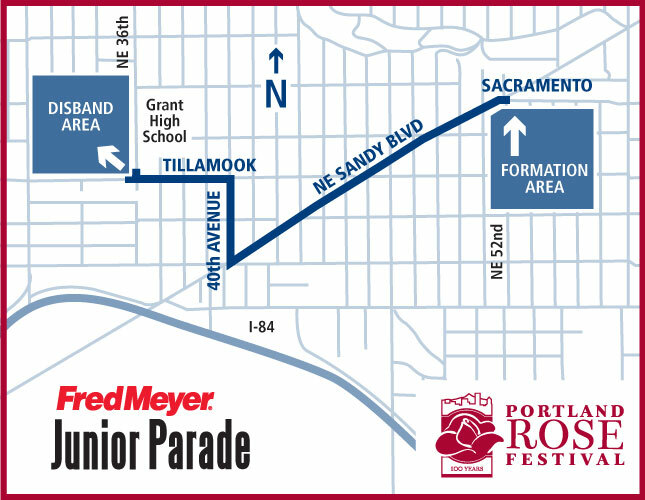 The same day the ships start to arrive, the Rose Festival’s Junior Parade will take place. Wednesday June 6 from 1 to 2 p.m., the parade will wind its way through the Hollywood District closing several streets in the area. Three bus lines – the 12, 75 and 77 – will be detoured for that parade from about 11:30 a.m. through 3 p.m. Be sure to check the Service Alerts page before you travel to or through the area. TriMet is always working to ensure that our riders enjoy a safe, positive, worry-free and user-friendly experience each time they board TriMet. Our Rider Support Team is on the job for you seven days a week from 7:30 a.m. to 5:30 p.m. Reach them at (503)238-RIDE (7433) and on Twitter at @trimethelp.